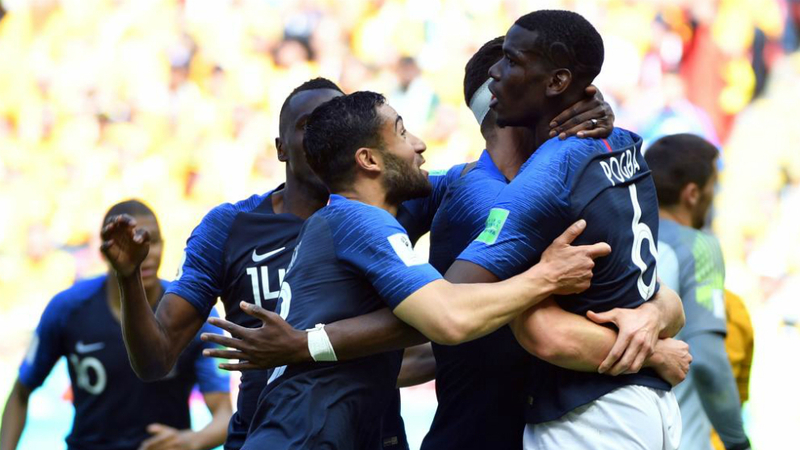 Technology assisted with both France goals as the 1998 winners began their World Cup campaign with a less-than-convincing 2-1 win over Australia in Group C on Saturday. The Euro 2016 runners-up took the lead through Antoine Griezmann’s penalty on 58 minutes after Uruguayan referee Andres Cunha was alerted by the Video Assistant Referee to Griezmann being fouled by Joshua Risdon. In a World Cup first, he gave the spotkick after reviewing the action on a pitchside monitor. France’s lead did not last long with Mile Jedinak dispatching a 62nd minute penalty after Samuel Umtiti was adjudged to have handballed and the VAR did not disagree. Technology intervened again on 81 minutes when Paul Pogba’s deflected effort was shown to have crossed the line by the goal-line technology system on the referee’s watch. The defeat was harsh on Australia, who had matched the fancied French for long spells. France, fielding their youngest side in an opening World Cup game since 1930, made a bright start with Kylian Mbappe – the youngest ever France World Cup player at 19 – having an early half chance saved. Pogba then went close with a free-kick and Greizmann, part of a fearsome front three alongside Mbappe and Ousmane Dembele, scuffed a shot in a good position. But Australia grew into the game and had the best opportunity of the first half. Aaron Mooy whipped in a free-kick and Corentin Tolisso almost scored an own goal but for an excellent save from captain Hugo Lloris on his 99th France appearance. Aziz Behich then curled wide as Australia ended the half stronger, much to the excitement of the sea of yellow shirts assembled in the stands in sunny Kazan. The second half began in lacklustre fashion until Griezmann burst forward and earned the penalty when he was caught by Risdon’s trailing leg. The VAR system is making its first appearance at a World Cup and worked perfectly in this instance, after the referee initially decided not to award a penalty. There was no doubt about Umtiti’s handball and Jedinak coolly converted. But there was to be another twist in the tale with Pogba charging forward and seeing his effort deflect off Behich, hit the bar and bounce down just over the line. No one was sure if it was a goal but the referee’s wristwatch quickly indicated the ball had crossed the line and video replays confirmed it. France will have to play much better if they are to challenge at this tournament, but will be glad technology helped them win their opener.